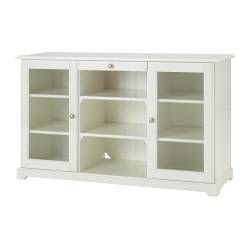 *The third post in a series of eight about IKEA at home. Previous posts #1 The Bathroom and #2 The Office. 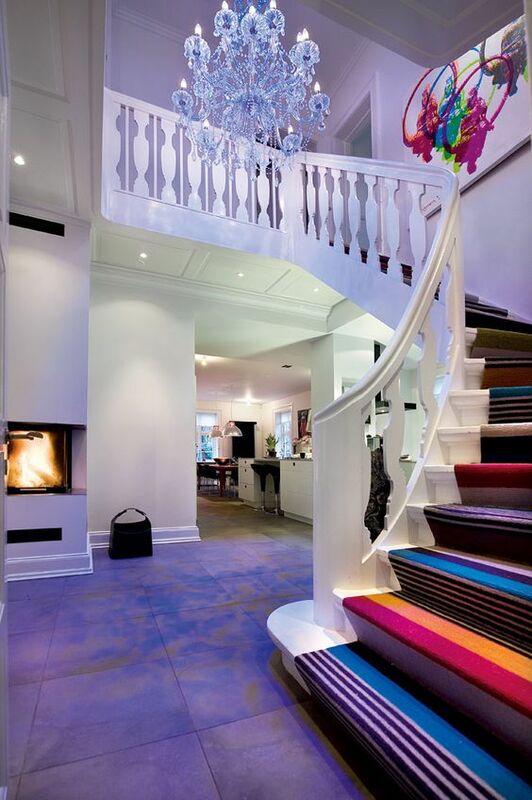 Hallways can be tricky spaces to decorate. They're usually long, narrow and often lack much needed natural light. Despite that though, I remember being told by my interior design teacher a few years ago, you can be really adventurous with the decor in your hallway, you can use bold patterns, statement paint colours and oversize lights, they'll all work because at the end of the day the function of a hall is really only a passage or walkway to go from room to room. You don't spend much time in a hall (unless you're my three year old and that's were the time-out is!) so technically you can be as eccentric as you like! I loved this idea, it made me think of all the wonderful design possibilities that I may have been too afraid to attempt elsewhere. Having said that, my hall isn't bold or brave or brash - maybe one day! I've taken a much more minimalist approach. In fact, up until a couple of years ago I purposely had nothing in it at all apart from a couple of mirrors and a tall plant. I wanted an uncluttered entryway - no surfaces to dump things! I wanted to follow the feng shui principles I was learning about at the time and make sure there was nothing in the way when you opened the front door that might create negative energy in the space. 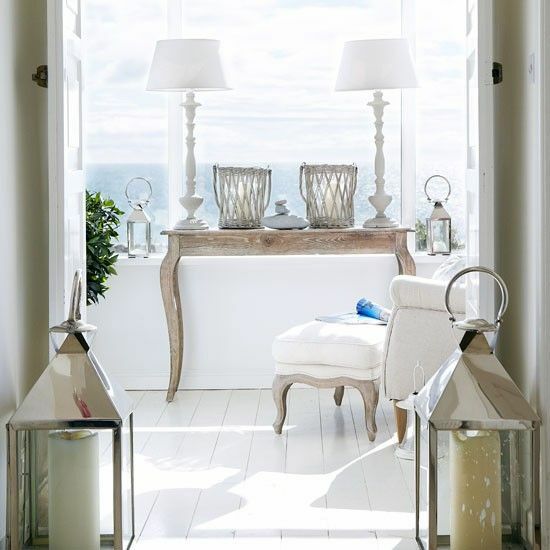 And although the hall is only a walkway to move from room to room, it's also the first place people see as they walk into our homes, I was looking for a tranquil vibe in mine! Fast forward a few years, when we quickly went from a family of three to five, and my priorities changed A LOT. I realised the uncluttered look was great but highly impractical - form follows function and all that... Instead of the 'feeling of serenity' I wanted to achieve as soon as you walked through the front door, now the most important thing was storage. Originally I wanted a temporary solution. I didn't want to spend lots of money on a hall unit, I hoped eventually I could remove it altogether and revert back to the uncluttered entryway. I presumed at some stage in the future they would be able to keep all their stuff under the stairs or in their rooms??! But it would be totally unfeasible for what we needed - space to store things. But neither were exactly right. I wanted a place for all their coats (they have about three each), hats and gloves, and other bits and bobs. I needed deep shelves that were easy to access as I was running out the door (often in a frenzy!). In the end instead of buying a hall table that didn't fit the bill exactly I opted for the Kallax shelving unit with Knipsa seagrass baskets. It had plenty of space for the type of storage I needed. 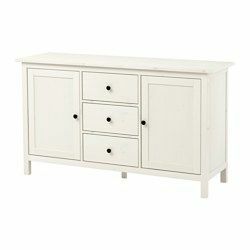 The items weren't on display making the hallway seem less cluttered and the best part about it, the unit cost just €25! 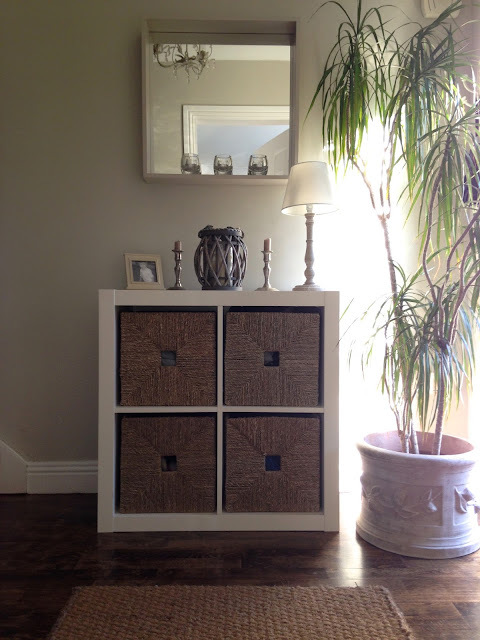 The shelves were a really inexpensive option, but the four Knipsa baskets did add to the cost at €18 each. In the end though it was half the price of the other units I was considering. The unit has maximised storage space next to the front door for the five of us and works really well. I was worried it might look like a shelf unit dropped there haphazardly but with a few accessories it fits right in and looks more like a hall table than a cubed shelving system. 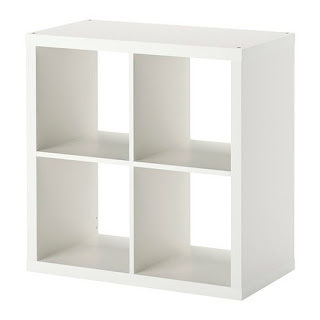 With options for this series to go on castors or be fixed to the wall the Kallax storage units are very versatile. At some point I would like to raise it slightly to give a more spacious feel to the hall. But for now the Kallax shelves with Knipsa baskets really work. 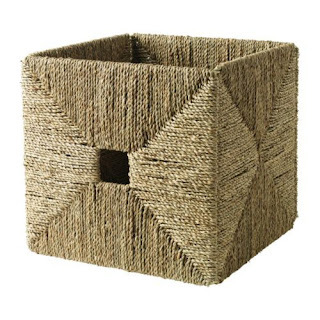 With the natural seagrass baskets, and the items out of sight, the hall still manages to achieve a semi-serene feeling (when the boys aren't running amok!). And I'm so used to them now I think I've changed my mind, they might actually stay. Thanks Alice! We also have that big basket of shoes, I try to keep it to one pair of shoes each so it's not too stuffed - #difficult!